I was in Seattle recently for the one-day Passenger Experience Conference, which ran concurrently with the annual Aircraft Interiors Expo. And while I’m having trouble accepting that everything I do in life should be viewed as an “experience,” I will say that this was one of the most enjoyable and educational days I have ever experienced. The daylong event played out with a series of short presentations and panel discussions with a cross-section of the commercial aviation sector onstage together – Boeing and Airbus alongside several airlines and even representatives from Google and the tech sector. All of the participants were trying to put their collective fingers on where the world of aviation is today and, more importantly, where it will be a year or two from now. Branding was a hot topic (no pun), as in the need for an airline to create a clear image that sets it apart from its competition. And with that, it’s so much more than simply slapping a new paint job on an old aircraft. For example, Mark Krolick, managing director of United Airlines’ marketing and product development division, talked about the challenges in melding United and Continental into one, big (700+ aircraft) family. Needless to say, it was not unlike the apocryphal tale of two giant pythons chowing down on opposing ends of dinner in the middle of the jungle and eventually meeting in the middle. With both sides firmly committed to their positions in the marketplace, the only way to resolve the impasse is for the larger of the two to open a little wider and devour the competition. For every passenger and even potential passenger, there are hundreds of opportunities to make a positive impression and just as many opportunities to get it wrong. Legacy airlines around the world are finding it increasingly difficult to find their place in the marketplace as passenger demands and expectations increase. The legacy carriers such as the “big three” in the U.S. – American, Delta and United – operate newer fleets that require high volume. The real money lies in first-class and business-class, but there’s not enough of a potential market there to carry and they can’t compete head-to-head with the low-cost carriers. In fact in 2013, more Americans flew domestically on low-cost carriers such as Jet Blue, Southwest and Allegiant than on the three legacy carriers. In Canada, Air Canada and WestJet are on solid ground today, but this is a business where a company is only as good as its next year. Or more precisely, meeting projections for its next quarter – the Achilles heel of publicly traded companies. 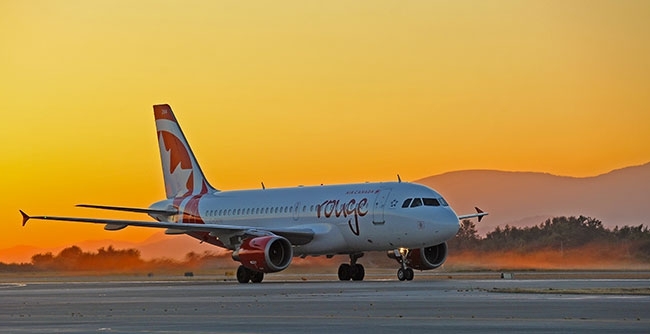 Air Canada is having great success with its Rouge brand, while WestJet is chasing both ends of the equation with its expanding fleet of Q400s and a quartet of 767s arriving in 2015 for overseas travel. Low-cost airlines around the world are growing by leaps and bounds. Ryanair is the airline people love to hate, yet they managed to attract more than 90 million customers last year and feel their future is sound enough to place an order for 200 new B737 MAX aircraft. How many new aircraft would they have on order if people actually enjoyed flying Ryanair? The keyword in Ryanair’s branding process is “cheap,” as in cheap flights. It’s a powerful attractant for a large segment of the market. At the other end of the scale, Etihad Airways will be featuring a super-ultra first-class experience on their London-Dubai route. Each of the A380s flying the thrice daily service will be outfitted with a Residence suite, which comes with three rooms and a dedicated butler. The cost, if you must ask, is a cool $20 thousand and it is for dual occupancy. About 40 years ago, I was walking along East Pender in Vancouver with a Chinese friend. We passed a popular local pancake house that sported four Chinese characters on the sign. I asked my friend what the characters said. After a couple of minute’s contemplation, he offered that the best translation he could come up with was, “if you eat here, your stomach will be happy.” The restaurant is long gone, but that memory has stayed with me and the food really was OK. In a world where it seems the public at large wants everything there is without paying for it, is it possible for our Canadian owned and operated air carriers to stake out positions at the high end and the low end while covering everything in between as well? Can an airline serve up happiness for its customers in the same way a stack of flapjacks might make your stomach happy? Some thoughts on that subject in the next installment.